just when i thought that life would quiet down after moving back from paris, i was swept into a whirlwind and would like to think that i’m finally settling back down to earth. i’ve been bouncing between san francisco and los angeles for work and was lucky enough to be around at headquarters for a pretty momentous occasion in the history of pinterest. we filed our sec-1 yesterday, which means that we intend to have an initial public offering, aka the ipo. i can’t say much else more, but i wanted to earmark this exciting life milestone here and would like to share that the day ended with tequila shots, cheeseburgers, and me completely missing my mouth when i tried to pour wine into it. speaking of career highlights, a few days ago, i had the honor of sharing the same stage as valerie jarrett at a company conference. ok. “sharing” the same stage might be an exaggeration, but i basically spoke right after her and even got to brush shoulders with her backstage. i tried to take in every bit of her during our split second encounter so i inhaled as deep as i could. she radiated so much warmth and smelled of cinnamon and sugar. valerie jarrett is most known for being barack obama’s advisor during his presidency and michelle obama’s boss at one point. i stood behind the curtains watching her speak on stage and sunk into gratitude and wonder over how insane life can be sometimes. never in a million years would i have thought that a daydreamer from the san fernando valley would make it to the point to have the opportunity to be standing a yardstick away from a prominent world leader who’s walked alongside the obamas ever since their early days. as i’m reflecting on the past week, i’m completely wrecked by thinking about the depth of god’s love and his perfect timing. i always think back to the hardest times i’ve been through and become reminded over and over of how i am really nothing, but he chose to surround me with so many beautiful and serendipitous encounters with family, friends, and strangers, moments standing in awe of this planet, and art that heals to help navigate through all of the darkness. i’m losing my marbles and crying up a tear storm on this plane. i don’t know if these anecdotes about my life are all that interesting to you, but i hope that it in some way encourages you to keep connecting the dots to look for all the beauty and meaning in your life. if you came here for a recipe, please scroll down. so. changing topics. 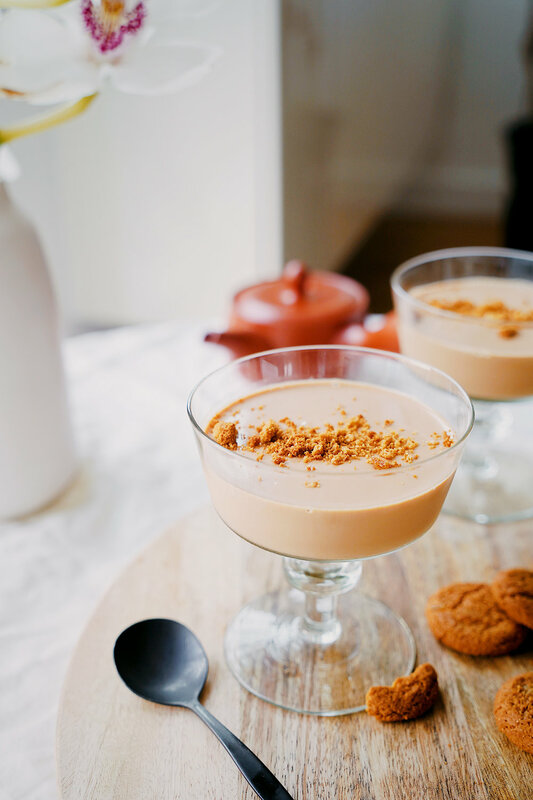 milk tea panna cotta. i was soOooper excited to bring the idea to life. it’s derived from the panna cotta that i learned to make in the cooking class i took in the chianti hills this past winter (thank you luca and lorenzo <3). we mixed in different flavors like lavender or ground coffee, but i thought, why not try steeping tea into the milk? it can be any kind of tea like chamomile or jasmine, but i chose black tea because it yields the same flavors of hong kong style milk tea that brings so many memories of #youth. i’d also like to add that this recipe feels like i’m manifesting my “abg” (urban dictionary it if you don’t know) days into a refined italian dessert. i don’t know about you, but i think boba milk tea was at one point the quintessential beverage of choice for any abg. however, long gone are the days of uber angst, streaky highlights on paper straight hair, braces, winged eyeliner, tamia on repeat, and overplucked eyebrows. i’d like to think that i’ve come a long way from the dark age, and this milk tea panna cotta is the perfect representation of that. i hope that you’ll be able to experience abg nostalgia in form of gelatinized milk, especially with some spicy crumbled gingersnap cookies. oof! in a small sauce pan, heat up heavy cream and sugar on medium heat. stir with a medium spoon until sugar is dissolved. be sure not to overheat or over stir the milk. if bubbles begin to form on the side of the pot, turn heat down a notch. once sugar is dissolved, bring heat down to low, immerse tea bags in pot and steep until milk becomes golden brown. feel free to gently press down on tea bags to release more flavor. be sure to be careful here because you don’t want to puncture the tea bags! this should take about 8-9 minutes. taste the mixture every few minutes, remove teabags when you get the milk tea flavor to your liking. take gelatin sheets that have been soaking out of water and stir into milk tea-cream mixture while heat is on low. stir slowly until gelatin has dissolved. pour mixture slowly into serving glasses and refrigerate for at least 3-4 hours. 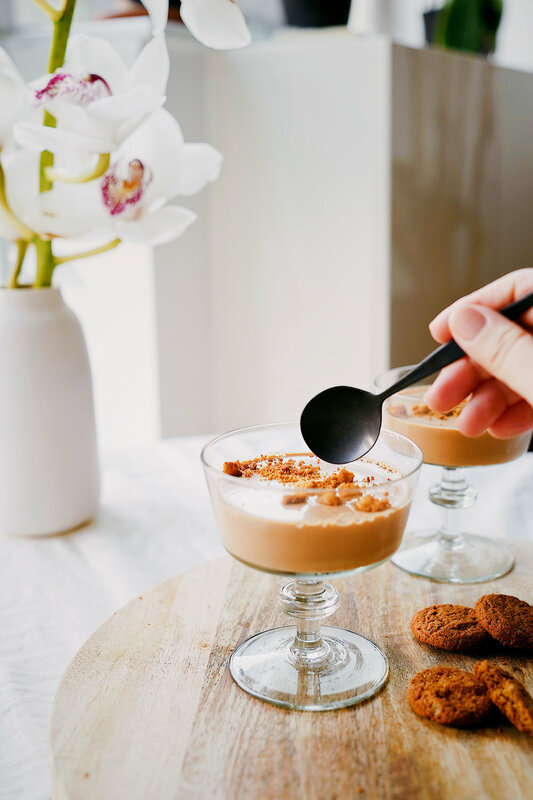 this is optional, but if you have gingersnap cookies laying around, crumble atop the panna cotta and enjoy!